Leaving Delphi we followed the winding road west along the coast of the Corinthian Gulf and crossed the Antirrio-Rio bridge to the Peloponnesus. Occasionally we would come around a sharp cliffside corner to see a rocky island rising from the blue sea. We drove east along the coast toward Corinth, and stopped at Xulokastro for lunch. We chose a restaurant with seating on the gulf, and it was the first place where English wasn't an option. The food was fantastic. The waiter brought bread and olive paste immediately, and we ordered mussels and shrimp and vegetables and a salad, with a carafe of white wine. After the break, we continued on to Nauplio, and walked through the Venetian section until we found a pension that wasn't booked; it took three tries. We stayed in a cozy third floor room of a lovely pension. It would have been impossible to carry our luggage up the steep, narrow staircase, so we brought just a few necessary items with us. Ours was the only room on that floor, and it had a small rooftop balcony facing one of the castles on the hill; at night the castle was bright with lights. The complimentary breakfast consisted of a top-rate Greek yogurt, plenty of bread and pastries, cheese, coffee, and a jam made from fresh apricots. 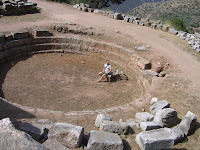 Nauplio was recommended to me by the graduate director at the University of Buffalo as a great base from which to explore Mycenae and Tiryns and Epidaurius. It is a beautiful town. The area where we stayed was close to the harbor, and accessible only by the narrow walking streets between the old Venetian buildings, with restaurants and shops tucked away everywhere. 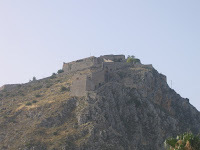 Overlooking the harbor are two hilltop castles, and there is a third castle about 500m out into the water on a tiny island. The boardwalk extends from the Venetian quarter and wraps around the cliffside, below one of the castles, to a public pebble beach. That first night we sat and had drinks at the harbor, surrounded by water, and mountains in the distance, and watched the sun set slowly, until it disappeared around the same time as my third margarita. With the sun gone, the street performers came out, some juggling flaming sticks, and others playing music. We found a restaurant late at night and had a delicious dinner outside under the stars. 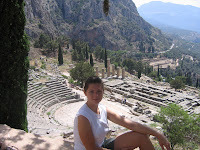 The only arrangement we made before arriving in Greece was a hotel room for one night in Delphi. 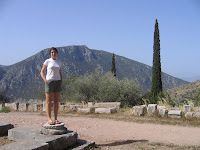 As soon as we landed at the airport, we rented a car, and drove to Delphi, which took a bit longer than we expected. We skirted Athens on the highway, and the road became less and less industrial as we progressed. We went through Thebes, but didn't spend much time there, because by then we realized how long the drive would actually take; it was nice to go through the town nevertheless. The mountains became larger as we approached Delphi, and finally we passed through Arahova, a very lovely little skiing village, only a few kilometers from Delphi. 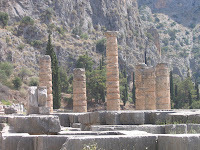 Upon entering Delphi, we had a bit of trouble finding our hotel, and it turned out that we were cut off from the main street by some road construction. After settling into the room, and taking a short nap, we grabbed our first frappé, and headed to the museum adjoined to the ancient site. 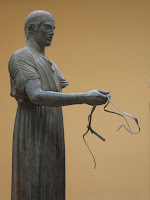 There was a copy of the ὀμφαλός stone in one of the rooms, but perhaps the most striking moment was coming around the corner to be surprised by the famous bronze charioteer, which I was expecting to see in Athens. The next morning we walked down to the lower site and saw the gymnasium and the Sanctuary of Athena. It is free to walk through this section, but still we were the only people there, and so we sat and enjoyed the breathtaking view out toward the Gulf of Corinth. 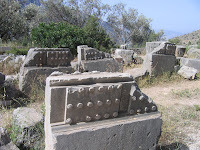 I was surprised that there were so many inscriptions still sitting outside at the sites, and especially at the Sanctuary of Athena, which wasn't gated; but I suppose it wasn't too long ago that you were permitted to climb upon the monuments. 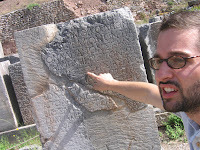 Here is a picture of me admiring an interesting representation of the letter xi that I hadn't seen before. It had one horizontal line at the top, and then below it was a small curved line that swooped down to the bottom left to connect to another horizontal line, so that the bottom two lines resembled the letter 2, rather than the three distinct horizontal lines which must have been far easier to carve into stone. After that we headed across the road to the upper site. I recognized many of the monuments, but it was interesting to actually experience the topography, which was much steeper than it appears from photographs in books. It was more crowded here, with several different tour groups all arriving at the same time: there was a group of older French tourists, another group of high school students from Egypt, and another Japanese group of all ages. The site was large enough to give some space, but there was definitely some tension between the older French tourists, and the Egyptian kids, who ran about the site yelling loudly to one another from different levels. On the path up there were many inscribed stones being left to weather along a nicely constructed stone wall. 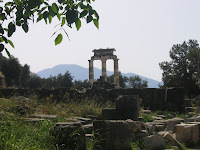 There were many treasuries on the site, which attest to the importance of Delphi in the Greek world. 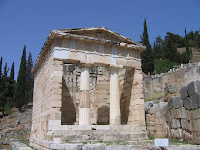 The Athenian treasury was fully reconstructed, and sat on the corner of the path that led to the Temple of Apollo, whose few pillars stood out from below and above. 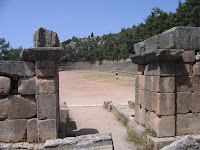 Just above the temple was the well preserved theatre first established in the fourth century. It must have been overwhelming to see a performance with the sanctuary and views of the deep valley in the background. At the very top of the site was the famous stadium first constructed in the fifth century and remodeled many times afterwards. It was surrounded with seats, and a backed bench in the center, which was presumably reserved for important spectators. The starting blocks at one end were still evident. Thirty or forty years ago my girlfriend's mother raced the length of the stadium with her mother and sister while people cheered them on, and we had planned to do the same thing, but foolishly we had worn flip-flops and sandals, and the ground was very uneven and rocky. After leaving Delphi, we drove down the mountain and through some of the most spectacular olive orchards that we would see, and west along the Corinthian Gulf to the bridge linking the Peloponnese. 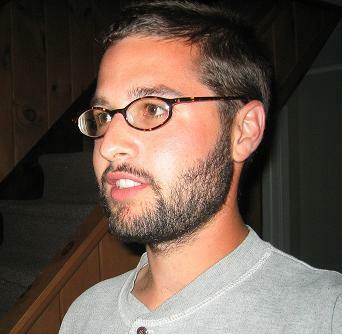 It was certainly my favorite overall site, although there were several other special places and moments that are important to me.